The Prime Measure of this investigation is 0.3168 Roman miles and the second most important measure is 3168 Roman palms, so it is especially interesting that 0.3168 Roman miles = 316.8° of Silbury Hill’s base perimeter and 316.8° of the full cone design’s 316.8 megalithic yard perimeter 1/2 way level = 3168 Roman palms. Below is demonstrated some of the monuments harmonious interaction which use several methods and one method is numbers as in gematria and the common use of the Musical Scale Chart’s numbers and also the constant use of the same strategic numbers in different forms i.e. with a floating decimal point. Another method of interaction is geographic such as global positioning and the geometric interaction is awesome, geometry is a form of mathematics and other methods of mathematic interaction are used. There is a common modus operandi in the designs such as for example the way many different units of measure are used. A Pyramid and a cone are two examples of simple solid geometric shapes and there are only a few, by simple I mean they have simplest formulas and methods for calculating their volumes and surface areas other examples are a sphere, a cube, a prism and a cylinder. The Great Pyramid and Silbury Hill as left by the builders were both simple solid geometric shapes with their peaks missing, a true pyramid represents a series of squares decreasing in size from the base to the peak and a cone represents a series of ever decreasing circles from the base to the peak. The Pyramid is geometrically and mathematically linked to the cube or cuboid and the cone has the same relationship to a cylinder, the vertical sections of a cone and a pyramid are triangles, the slope angles of Silbury Hill and the Great Pyramid are both very special. Below demonstrates how the designs of Silbury Hill and the Avebury monument interact with each other and produce basic measurements relating to the full design Pyramid’s base perimeter and its height. The 1 mile or 63360” circumference circle shows the relationship of Silbury Hill’s slope angle to the full design Pyramid it is especially interesting because of the relationship of 63360” to the full design’s volume i.e. 63360” cubed x 0.0006336 = the volume. different measurements and each one is a profound design factor. Summer solstice or midsummer’s day is the big day of the year at Stonehenge when thousands gather to see the sunrise and Stonehenge’s Station Stone Rectangle is aligned to the summer solstice sunrise and moonrise azimuths so it must mean something. If we mark the solstice azimuth and the cardinal points of the compass through the centre of the monument it produces 8 sectors and the angle of each sector is the same as the Great Pyramid’s slope angle measured either horizontally or vertically. The shortest distance between any two points on the earth’s surface is on the circumference of a great circle and one diagonal of the 9123.84” perimeter Station Stone Rectangle is on the azimuth of a 9123.84 megalithic mile circumference great circle connecting Stonehenge to the 9123.84” wide full design Great Pyramid. Note that 9123.84” = 3168 Roman palms so we connected the 3168 Roman palm perimeter Station Stone Rectangle to the Pyramid’s 3168 Roman palm square base by the 31680 furlong radius great circle of the earth. These factors are connected, Silbury Hill’s base perimeter = 633.6 megalithic yards and the full cone design’s 1/2 way level has a 316.8 megalithic yard perimeter. The Pyramid’s full design has a 0.6336 Roman mile perimeter = 633.6 Roman paces and the 0.3168 Roman mile perimeter of the ½ way level = 316.8 Roman paces. Stonehenge’s Outer Bank has a radius of 3168 Roman digits or 31.68 fathoms and the 6336 Roman digit diameter = 63.36 fathoms. 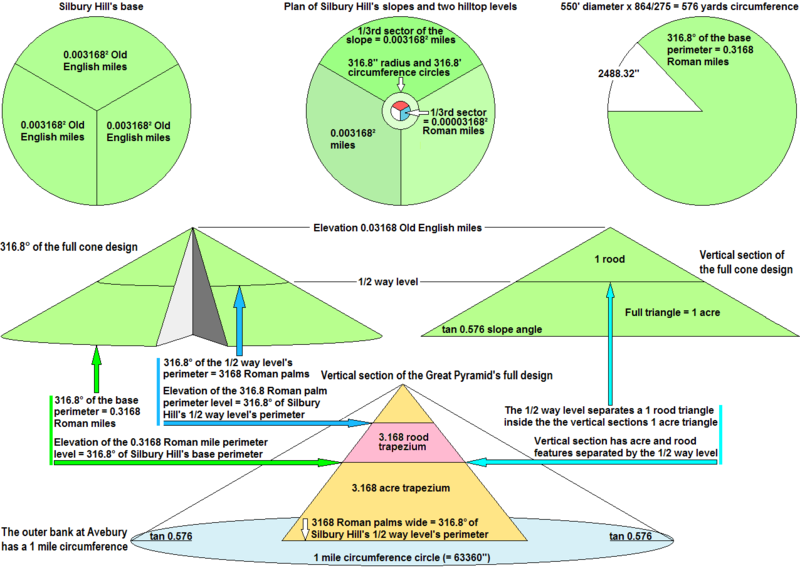 The mile is the product of 31680” + 31680”, the 31680 furlong radius earth has a 63360 furlong diameter, the Pyramid geographic mile = 6336 Roman feet or 2 x 3168 Roman feet which is 2 x the full design Pyramid’s base perimeter. The designs of the monuments thoroughly exploit the fact that 4 x 0.3168 Roman miles = 1 Pyramid geographic mile, 0.3168 Roman miles + 0.3168 megalithic miles = 1 Pyramid geographic mile and 3168 Roman feet + 3168 Roman feet = 1 Pyramid geographic mile.